The Bandipur National Park is one of the most fascinating wildlife centres of South India, located in the southernmost part of Karnataka. Stretching along the Kerala-Tamil Nadu border and lying on the Mysore - Ooty highway and covering a forest area of 874.2 square kilometers and 780-1455 m above sea level, it is one of the oldest wildlife sanctuaries of India. 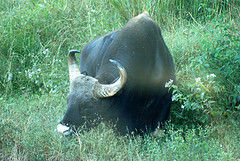 It was once Mysore Maharaja’s private hunting park and later in 1941, it was expanded to adjoin Nagerhole National Park in the northwest and Kerala's Wayanad Wildlife Sanctuary in the southwest and Tamil Nadu's Mudumalai Wildlife Sanctuary in the south which now together constitute the Niligiri Biosphere Reserve. The rivers like the Kabini, Nugu and Moyar passes through this National Park. For the nature lover, this National Park is a treasure house to be explored. The name Bandipur National Park was given in the year 1973 when the Government took over the park under the Project Tiger Scheme and it was then made into a Tiger Reserve. The animals on this National Park include tigers, elephants, sloth bear, four horned antelope, Sambar Chithal, Gaur and many more. This National Park is home for the beautiful birds like the Grey Jungle Fowl, Malabar, Trogon, Woodpecker, Weaverbird, Brown Hawk Owl, Weaverbird, Kingfisher, Bay Owl, Warbier and a number of rare species of birds. Elephant safari is an exciting feature of this National Park wherein you could actually tour the park sitting on the back of an elephant. Jeep safari is also available. By Air: The nearest Airport is Bangalore, 220 kms away. By Rail: The nearest Railway station is Nanjangud, 5 km away. Mysore railway station (80 km away) is the major railway station. By Road: Bandipur is well connected by road. State Transport Buses, private tour operator buses, or taxis can be used. This video will give you an idea what you can expect there. Though it may be a language unknown to you visually you will be able to understand a lot about the place and animals.